Celebrity places a high emphasis on food and the quality of the food onboard is generally of a high standard. It also has a stand at Taste, the food show which takes place in London every year. Guest chefs showcase meals onboard, and "The Wine Show" experts Joe Fattorini and Amelia Singer, pair the wines. Celebrity's partnership with "The Wine Show" means regular wine-themed cruises and tasting experiences onboard. Unlike on many ships, if you choose to only eat in the ship's main dining room -- Moonlight Sonata -- you will not be disappointed. The quality of cuisine is so high and the choice so extensive that it feels as if you're eating in a different restaurant every night. The other main free dining option is the Ocean Cafe buffet, which has two main pluses: a wide variety of cuisine and a well-thought-out layout, with different sized tables, lots of smaller spaces and banquette seating for larger groups. It also includes outside seating on the aft deck. Suite and AquaClass passengers have their own restaurants -- Luminae and Blu -- but can also eat in the main dining room. Celebrity offers fixed-time dining at 6:45 p.m. or 8:15 p.m., or Celebrity Select dining, which gives passengers the opportunity to dine at any time between 6:30 p.m. and 9 p.m. You can make advance reservations or simply show up. Moonlight Sonata (Decks 3 and 4): The towering, airy Moonlight Sonata is the ship's main dining room, spanning two decks at the aft end of the ship; it's open for breakfast, lunch and dinner. The room is bright and light in tone and makes ample use of the ship's signature design element, glass. The showstopper element is a two-story glass wine tower, replete with tall ladders to reach the bottles at the highest levels. Surprisingly for a ship with 2,800 passengers, this single restaurant feels spacious and uncrowded. There's ample room to navigate between tables, and the room's openness, combined with extensive carpeting on the floors, results in a tolerable noise level. Service is prompt, attentive and friendly. The dinner menu is not overloaded with choices, offering a total of seven entrees, including a salad entree. Although no separate spa, vegetarian or heart-healthy menus are added on, at least one choice per course qualifies for each category. In addition, the chef suggests his favorite from the available options, and several "classic favorite" options are available nightly, including Caesar salad, salmon, New York strip steak and creme brulee. We found the cuisine to be a mix of French, Italian and "New American" styles, with contemporary popular ingredients -- phyllo, Yukon Gold potatoes, feta cheese, fresh fennel, etc. -- conspicuously present. We'd also like to give kudos to the entree salads. We're generally not fans of main-course salads at dinner, but these are hearty concoctions, such as an arugula salad with sliced grilled "Gaucho" steak, fresh marjoram and bacon ranch dressing. Lunch salads in Moonlight Sonata also shined and were one of the only midday menu items that could lure us away from Oceanview Cafe or the Bistro on Five creperie. Moonlight Sonata is open 7 a.m. to 9 a.m. for breakfast, noon to 1:30 p.m. for lunch and 6:45 p.m. and 8:15 p.m. for set-seating dinner or 6:30 p.m. to 9 p.m. for Celebrity Select dinner. 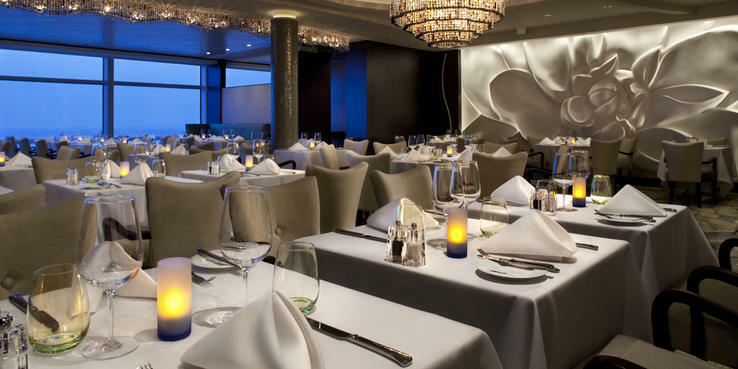 Luminae (Deck 4): This 92-person restaurant is free -- but only to those people booked in suites. It's open for breakfast, lunch and dinner every day. Luminae has been carved out of the main dining room, but it's hard to tell where, and you enter and leave by a different entrance. Inside, it has a contemporary look and feel: lots of light, chrome and glass, as well as white and yellow furnishings to reflect the meaning of its name (light). It's split into two separate spaces, which gives the feeling of intimacy and exclusivity Celebrity is trying to create. Luminae has its own galley, separate from the main dining room. Menus change daily (as in they are never repeated) and are freshly prepared -- often with produce sourced from the port visited that day. The menu is limited intentionally, apparently, to ensure the selections are always fresh. It features just four appetizers, five mains and three desserts. Less is more, apparently, as the food there is outstanding. Service and ambience are, too. For example, for one dinner on our sailing, we had the following choices to start: Maine Lobster salad, beef tartar, Jerusalem artichoke soup and roasted squab. We opted for the salad, which was superb. What was noticeable was how knowledgeable the waiters were, describing in detail what each dish contained and suggesting wine pairings. They also made a point at the start of the meal to advise anyone with food allergies that off-menu dishes could be prepared. The mains consisted of: venison ragout, Alaskan halibut, veal loin, cote de boeuf and cauliflower steak with curried yogurt. The cote de boeuf was outstanding, so too was the halibut. The delectable desserts included chocolate palet, mascarpone cheesecake and buttermilk panna cotta. Breakfast includes omelets, pancakes and waffles; lunch might be hamburgers, a pasta dish and a soup, among other items. The sea-day brunch offers a mix of breakfast and lunch dishes, such as grilled salmon and a crab cake burgers. Luminae is open 7 a.m. to 9 a.m. for breakfast, 10:30 a.m. to 1 p.m. for sea-day brunch, 1 p.m. to 2 p.m. for port-day lunch and 6 p.m. to 9:30 p.m. for dinner. Blu (Deck 5): Another private dining room reserved for passengers booked in Celebrity's AquaClass category, Blu has a menu similar in course structure to that of the Moonlight Sonata (appetizers, soups and salads, salad entrees, main entrees, Everyday Classics and Sommelier Recommendations). It differs in both the number of offerings (one or two fewer in most categories) and the style of cuisine, relying less on rich sauces and sauteeing and more on natural reductions, ragouts and herbs. And you can never escape from the calorie count, which is printed next to each dish. We found the food rather soulless and uninspiring, and the atmosphere was quite cold. AquaClass passengers do not have to pay extra to dine there, but suite passengers may book tables on a space-available basis, for free. The restaurant is otherwise off limits to regular passengers. It's open for dinner only from 6 p.m. to 9:30 p.m.
Oceanview Cafe (Deck 14): Nine decks directly above Moonlight Sonata is the Oceanview Cafe, an expansive multi-station buffet for breakfast, lunch and casual dinner. Outside of regular mealtimes, ice cream, pizza, pasta, sushi, afternoon tea and late-night snacks (from 9:30 p.m. to 1 a.m.) are on offer, all without additional charge. A juice bar serves up particularly delicious freshly squeezed OJ, but it will set you back a few bucks. The buffet layout is excellent, with many serving and prep stations situated as islands in the middle of the room, rather than stretched along the walls. The result is a dependably uncrowded, spacious operation offering an extensive number of choices. Besides the conventional dinner choices, which tend to mirror what's served each evening in Moonlight Sonata, British (bangers, English bacon, baked beans, Marmite, Alpen -- but only when in Southampton) and Asian (miso soup with mix-ins, tofu, rice) stations, as well as vegetarian and carved meat stations, round out the mix. The standard breakfast selections don't change (omelet station, Canadian and American bacon, turkey and pork sausage, potatoes, fruit, pastries and breads). We found the breads superb, especially the house-made English muffins. Lunch features one changing "Chef's Choice" station (primarily a carving station for ham, leg of lamb, beef, etc.) in addition to tacos, pastas, stir-fry, sandwiches, soups, salads and other specialty stops. Sandwich choices include hot (corned beef) or cold (turkey, chicken salad) options. Diners can customize their pasta choices with sauce selection (marinara, alfredo, garlic/butter) or select meats, spices and veggie mix-ins for their stir-fries. There is plenty of elbow room between tables, and attentive waiters are available for assistance for those who require it. It's open 6 a.m. to 9:30 a.m. for breakfast (9:30 a.m. to 11:30 a.m. for late breakfast), noon to 2:30 p.m. for lunch, 3:30 p.m. to 4:30 p.m. for afternoon tea and 6 p.m. to 9:30 p.m. for dinner. Mast Grill (Deck 14): On the same level as the Oceanview Cafe, but forward of the main swimming pool, the Mast Grill serves burgers, hot dogs, fries and the like. It's open 11 a.m. to 7 p.m.
AquaSpa Cafe (Deck 15): The in-spa cafe offers healthy breakfast and lunch options, including Birchermuesli, fat free yogurts, granola bars, light breads and omelets for breakfast. Lunch might consist of poached salmon or tuna and grilled or seared chicken breast. Smoothies will cost you $4.50. The cafe serves tea, coffee and juices throughout the day. Open 7 a.m. to 10 a.m. for breakfast and noon to 2:30 p.m. for lunch. Room Service: Room service is available 24 hours a day from a limited menu of sandwiches, pizzas, salads and desserts. There are upcharges for certain items, and between 11 p.m. and 6 a.m., there's a $3.95 charge for passengers in interior, oceanview and balcony staterooms. Full or Continental breakfast is also served. Breakfast is available from 6:30 a.m. to 10 a.m.
Qsine (Deck 5); $45: Qsine (pronounced "cuisine") has been a massive hit since its debut on Eclipse. The decor is intriguing -- upside-down chairs and chandeliers -- and the food is an interesting blend of tapas-style tastes with gourmet interpretations of ethnic comfort food. The menu, presented on an iPad (also used to make your order), includes delicious dishes like Kobe beef sliders, sushi lollipops, lobster fritters, "chintinis" (Chinese dishes served in martini glasses), "disco" shrimp (poached tiger shrimp) and, for dessert, beignets, cupcakes and cheesecake bites. It's not for everyone, and some people may find it all a bit too whimsical if they're craving a "proper meal." It also lasts for hours, so be prepared to settle in for the night. But if you're on for a week, it's definitely worth a try -- even if it's just for a completely different dining experience. Open 6 p.m. to 10 p.m.
Tuscan Grille (Deck 5); $35 pre-cruise, $45 onboard: The ambience of Tuscan Grille, Eclipse's Italian steakhouse restaurant, is described by Celebrity as "Napa meets Old World Italy." We agreed with this description as we entered through a "wine cave"-like archway into a genteel room with ornate furniture and place settings. Tuscan Grille also has the best view of any restaurant aboard the ship, being situated all the way aft. A meal in Tuscan Grille, in our estimation, is best enjoyed on the early side, before the sun goes down and while there are still seats right up against the wall of glass facing the trailing wake of the ship. The grilled meats and seafood can't be beat, although we were mildly disappointed in the pasta choices -- only four, and the sauces are conventional: Alfredo, Bolognese, Toscana (meatballs and tomato sauce) and Parmiggiana. Other signature touches are an antipasti bar and Caesar salad prepared tableside. We enjoyed a perfectly grilled veal chop, preceded by the excellent preparation and presentation of a Caesar salad for two. There is also the opportunity to pay for upcharge items (steaks) like $15 for a bone-in New York Strip, which was the largest steak we've seen on a ship. Open: 6 p.m. to 10 p.m.
Murano (Deck 5); a la carte or $45 pre-cruise/$50 onboard: Celebrity is renowned for its high-quality French alternative restaurants. On Eclipse, the restaurant is called Murano, and the theme is Continental with a tilt toward new French. The centerpiece is a six-course tasting menu, featuring an appetizer, soup and salad, fish course, palate cleanser (sorbet), meat course and dessert; all of the dishes except the sorbet come from the a la carte menu. There are two choices for each course on the tasting menu, and there's an option of a wine paired with each (which raises the surcharge to $89). The a la carte menu choices are bold -- caviar, escargot, sweetbreads, foie gras, venison and the like -- but familiar faves abound, such as filet mignon, duck breast, lobster tail, and surf and turf. We had the sweetbreads, which came out delicate, light and crispy, followed by Dover Sole Veronique, sauteed with white wine and grapes. There is a "Market Price" surcharge for a caviar option. Open 6 p.m. to 10 p.m.
Sushi on Five (Deck 5); a la carte: This replaced the creperie that was originally on Eclipse, for more on-trend sushi at a la carte prices. Rolls start at $9 and you can also get small plates such as kobe beef ramen sliders from $8 and BBQ pork ramen bowl from $9. Assorted sashimi is from $8. Open Port Days from 3 p.m. to 11 p.m. and on Sea Days for lunch from Noon to 3 p.m. and dinner from 6 p.m. to 11 p.m.
Cafe al Bacio (Deck 5); a la carte: Located across from Bistro on Five, this coffee bar was one of our favorite spots for a light snack. The food, from pastries to small sandwiches, is complimentary, but the overpriced beverages cost extra ($6 for a latte). A gelato bar (on the opposite side of the room) dishes out cold concoctions, also for a fee. Open 11 a.m. to 11 p.m.